Every now and again the actual subject of a film is so incredibly engrossing that (upon its first viewing at least) the actual filmmaking presents as superfluous. The Invention of Dr Nakamats (2009) is one such film. 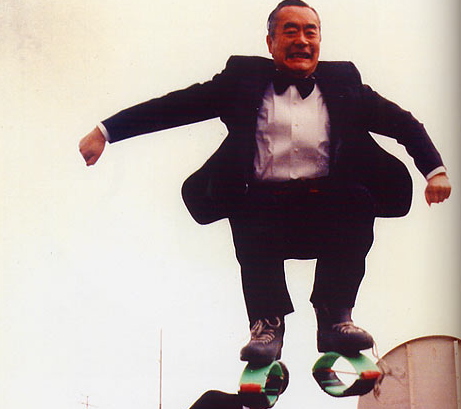 Dr Nakamatsu is one of those incredibly endearing individuals who just about maintains the right kind of balance between genius and insanity. Keeping himself “active, aggressive, strong” through the use of many of his own crackpot inventions, an absolute maximum of four hours sleep a night and an unparalleled belief that 0.5 seconds before death is the optimum moment for brain activity and thus invention, Dr Nakamatsu reaches the ripe old age of 80 and not only hopes, but honestly anticipates, living to around about 143. For some of the strangest yet most wonderfully wild mantras you’ll ever hear, including his “criteria” for buying a camera; “I smell the camera. Good smell is good camera. Bad smell or no smell, that is bad camera.”; The Invention of Dr Nakamats is an absolute must-see. The Invention of Dr Nakamats is screening as part of the Flawed Geniuses strand of this year’s MIFF and will be screening again Sunday August 08 7pm at Greater Union Cinema 4.